Blaze ran at the Anthracite Brittany Club field trial yesterday in the horseback open gun dog stake and brought home a red ribbon. This was a 33 dog stake so he collected another 2 points toward his field champion title (he has 7 points now)!! I could not have asked for a better performance from him. He was forward, held his edges, rimmed all the fields on the grounds, handled kindly and had 2 really nice pieces of bird work. I think he's a keeper! Nice job Blaze. I agree that he is a keeper. 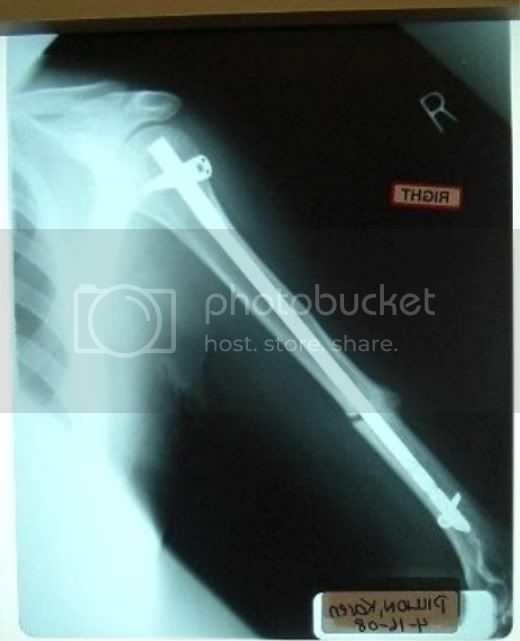 How is your arm doing? We haven't had an update in quite awhile. The bone facing out is healed with a nice callus but the inside portion of the bone hasn't filled in yet. 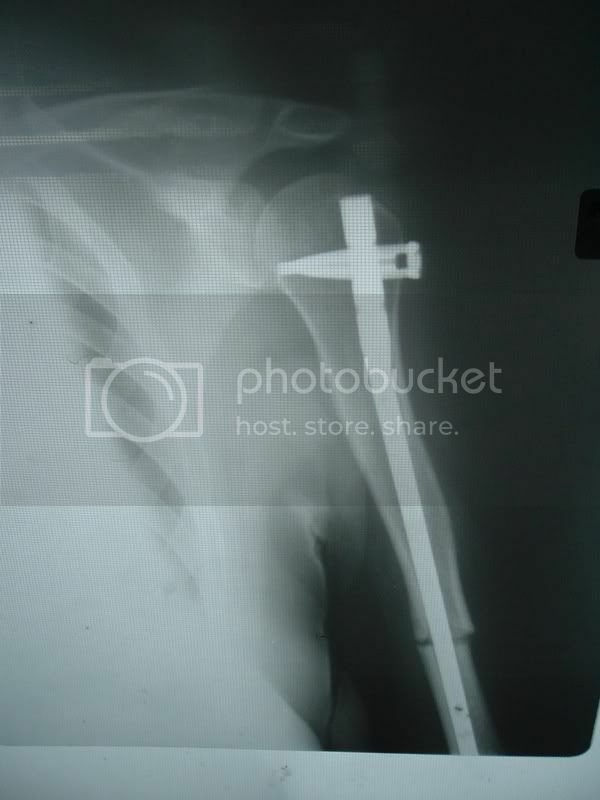 I go for more x-rays the middle of June, so with a little luck, the inside portion will be filled in and callused also. At that point I need to schedule a procedure for some hardware removal. I'm told it'll be quick and easy with no recovery time....lets hope he's telling me the truth! You must have the Brittany spirit to be able to trial with that injury! Oh Karen your arm looks really painful. I hope the next visit to the doctor gives you great result. Thanks all! The arm must look WAY worse than it feels because I'm really doing well. I have between 70-80% of my range of motion back at the shoulder and am in very little discomfort these days. I can predict the weather for sure, and I'm really looking forward to being able to sleep on my stomach again, but it's really not that bad anymore. Congrats to both of you and hope that arm continues to heal, keep us posted. Congrats Karen, way to go Blaze. I'd say hes a like a keeper. 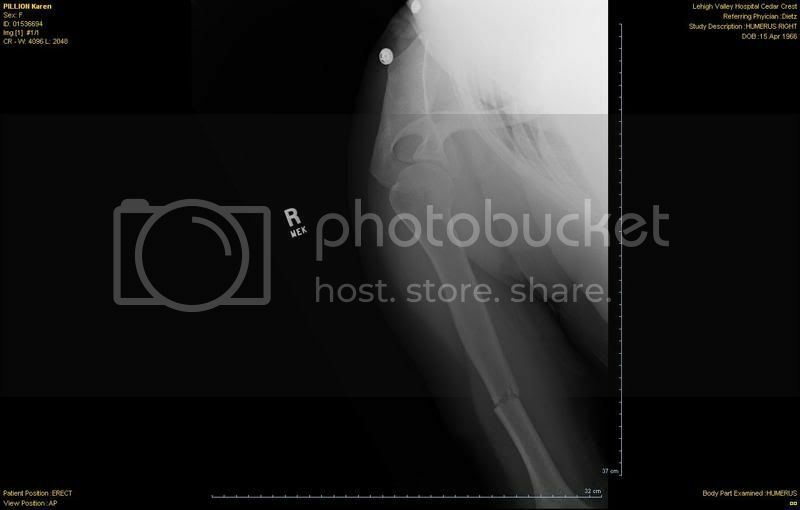 Your arm might not hurt too bad but that xray sure is nasty looking. Good luck with your next doctor visit. Have you got back on a 4 wheeler yet? That had to of really hurt. I am glad that the mending process is going well. I don't know if you realize it or if I should mention it since you are a woman and all, but you just posted you birth date on the internet for everyone to see . Yes, I've been back on a 4-wheeler and the horse (just this month). Doctor finally cleared me to have fun again, so next season Blaze is going to have to deal with me as his handler (poor baby!!). Karen_P wrote: I think he's a keeper! I never met a Blaze I didn't want to keep.... Congratulations from one Blaze's mom to another.